The Lithium Batteries Label: Update for Legislation - Buy Directly Online! New Lithium Batteries Label and Mark to come under changes to dangerous goods transport regulations, effective 1st Jan 2017. All Lithium batteries may be subject to a so called ‘thermal runaway’. This occurs when the internal circuitry is compromised, causing an increase in temperature in one or more of the cells. The heat can reach a point where the cells vent hot gasses, which can then increase the temperature in neighboring cells until there is ignition and a fire. In short; because of the tendency of lithium batteries to ignite and burn violently when exposed to heat or fire, large quantities of batteries pose a significant safety risk, especially to aircraft. A shipment of lithium batteries can intensify the severity of a fire considerably and a relatively small incident can lead to an uncontrolled fire. 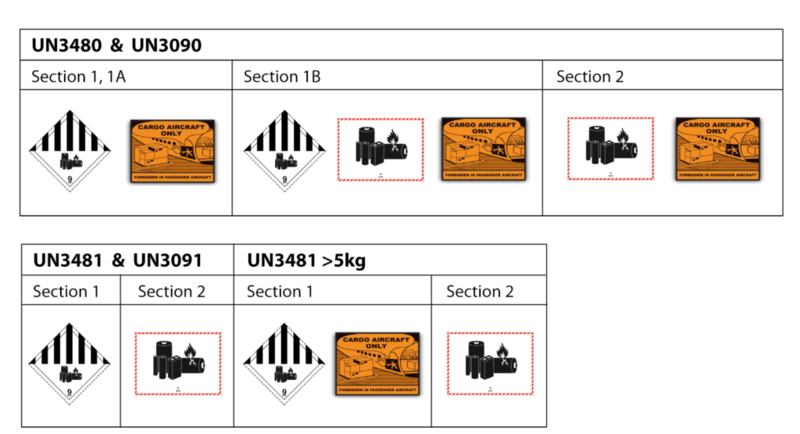 In order to identify packages containing lithium batteries it is essential to label them as specified under the appropriate dangerous goods regulations. The two new Lithium Batteries labels shown below apply to all modes of transport. 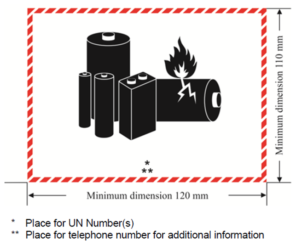 The telephone number included on the lithium batteries label should be of a person knowledgeable about the shipment, but this is not intended to be for the purposes of obtaining immediate emergency response guidance, and is therefore not required to be monitored at all times that the package is in transit. It is acceptable for the number to be monitored during the company’s normal business hours in order to provide product-specific information relative to the shipment. However, it also is acceptable to use an emergency response, 24-hour phone number on the label, such as Chemtrec. A NEW Class 9 Lithium Batteries label replaces the existing Class 9 label for shipments that are subject to the full regulation as Class 9 hazardous materials. The new Class 9 Lithum batteries label must have seven vertical black stripes in the upper half of the label. 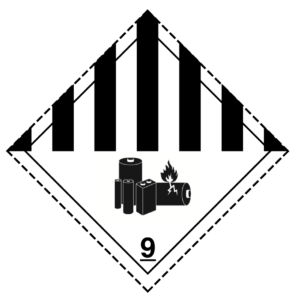 The symbol (a group of batteries, one damaged and emitting flame) and an underlined number 9 must be black and white and appear in the lower half of the label. Lithium-metal batteries shipped by themselves – UN 3090 (not contained in, or packed with equipment), have been banned from being transported as cargo on passenger aircraft since 2014, after lithium-metal batteries were linked to two fires aboard aircraft; unstable, over-charged batteries were thought to be a contributing factor. 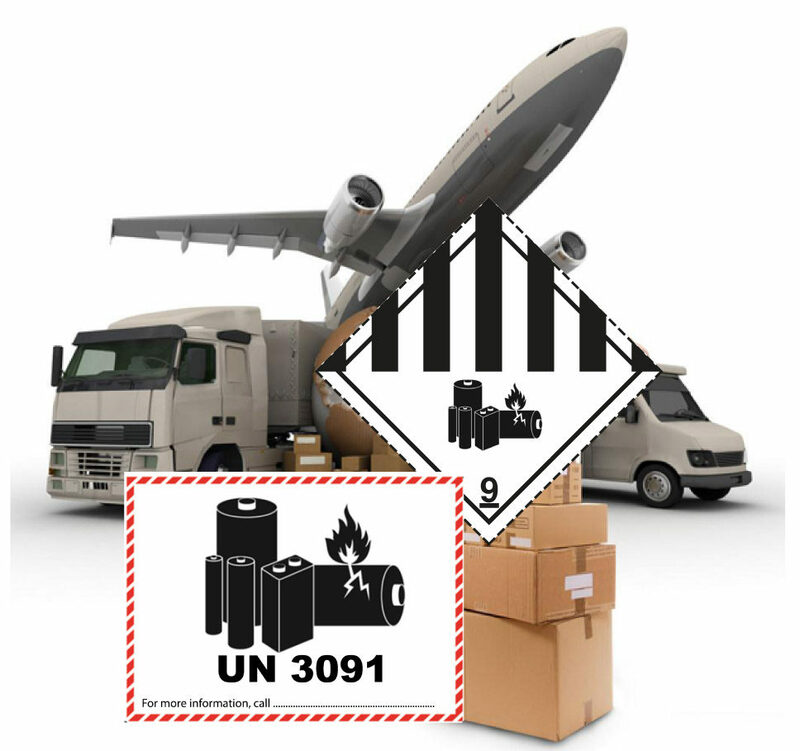 From 1st April 2016, lithium-ion batteries shipped by themselves – UN 3480 (not contained in, or packed with equipment), are also to be forbidden for transport as cargo on passenger aircraft. In addition, when transported in dedicated cargo planes, they must also be shipped at a state of charge (SoC) not exceeding 30% of their rated design capacity. The latest prohibition on lithium-ion batteries from passenger aircraft has come after extensive reviews by the U.N.’s International Civil Aviation Organization (ICAO). The ban applies to shipments in passenger plane cargo holds and does not include the batteries inside gadgets that passengers travel with – for now. Both the new Lithium Batteries label and Class 9 Battery label have a voluntary compliance beginning January 1, 2017. Mandatory Compliance begins January 1, 2019.